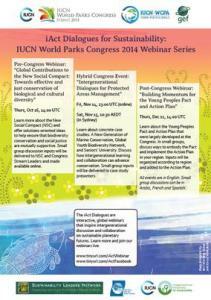 We encourage you to participate in the IUCN World Parks Congress 2014 iAct Dialogues for Sustainability Series – youth to elders are all welcome! The iAct Dialogues are interactive, global webinars that inspire intergenerational discussion and collaboration on sustainable planetary futures. Events are being held 16 Oct, 14/15 Nov and 11 Dec 2014. These webinars are made possible through a grant secured in collaboration with WCPA Young Professionals from IUCN/UNDP/GEF, as well as the committed volunteer efforts of the iAct Working Group. Webinars are organized by Sustainability Leaders Network, Earth Charter International and the IUCN Task Force on Intergenerational Partnership for Sustainability. This entry was posted on Wednesday, July 30th, 2014 at 10:28 am	and is filed under SLN Blog, Youth Blog. You can follow any responses to this entry through the RSS 2.0 feed. You can leave a response, or trackback from your own site.